French toast for breakfast was small compensation for having to rise at 5am after a night disturbed anyway by a thunderstorm. Lightning was still flashing on the horizon as we ate. Then we lurched away along the rutted track from the resort, and along roads already busy with people setting up their stalls for the day, taking neatly-uniformed children to school, sweeping the verge with twig besoms. We had a welcome (and unusual) coffee stop at the point where the Equator runs through Uganda, with the usual marker and souvenir shops, and the obligatory photos. It was all a bit ramshackle: Ecuador does a more professional job, I have to say. Then we carried on through the non-stop roadshow, with always something new to spot: like the small boy doing the time-old hoop and stick thing, but modernised using a wheelbarrow tyre propelled with a plastic bottle cut to shape. Or the two men on a motorbike with a live goat draped over it between them. Or the butcher’s with a carcass hanging outside, a marabou stork pecking at it. Our lunch stop was beside the road in a rural area that nevertheless produced a small audience within minutes: mostly little kids in ragged clothes, watching with interest and no expectation as we ate our salad sandwiches in the shade of a tree under their intent gaze. Awkward. We gave them nothing (it would have been bad training) and they appeared to wave us off cheerfully and with no resentment. We carried on past endless banana plantations and fields of maize and stopped in the town of Mbarara for groceries, snacks and ATM visits (though Edwin neglected to remind us that we needed to have enough cash for tomorrow’s chimpanzee expedition, tch). The town was buzzing, especially with motorbike traffic. There was one with four men on, lots with three, with women on the back sitting sidesaddle (some on their phones), with sunshades/umbrellas, with huge loads strapped on. There’s no sneaking free looks inside newspapers here, by the way: they’re all stapled shut before being put on the stands. Finally, we arrived at our camp for the night, candidly - and accurately - described in the trip notes as ‘basic’. No lie! 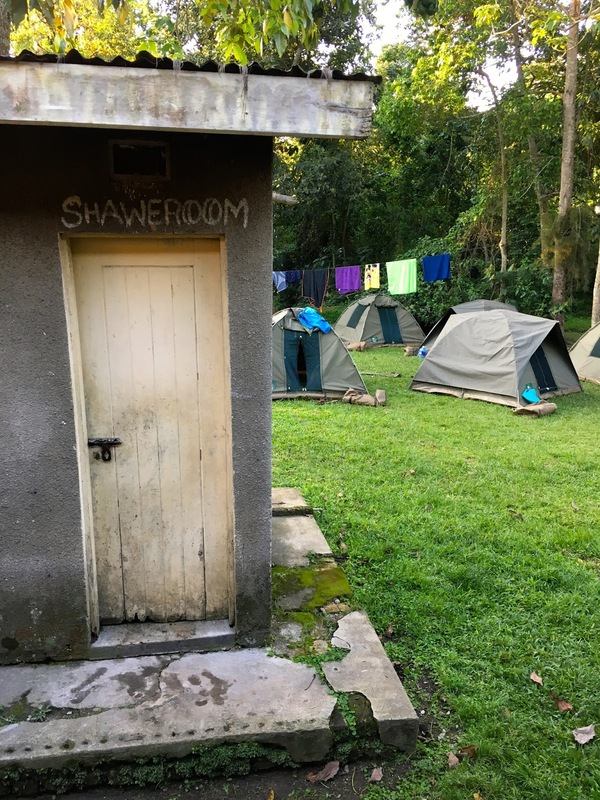 The tent area was rough grass, the loos were smelly sit-upons flushed with water from a barrel and no light inside, the shower was a concrete cell with a single pipe for the water. The people who pitched their tents under the big tree discovered that enviably massive round avocados fell from it periodically with a huge crash – night and day. Baboons emerged from the surrounding jungle to scavenge what they could. The road alongside was busy with big trucks. But we had beer – Nile Special, in 500ml bottles, 5.6% - and that made everything better. Plus OT approved of my post-dinner pot-scrubbing. So that was all right.